There were many displays of remembrance of the centenary of World War I at Darlaston Town Hall. I am pictured above with Malcolm. After the Remembrance Day service at the Town Hall there was a video and exhibition of previous remembrance ceremonies. 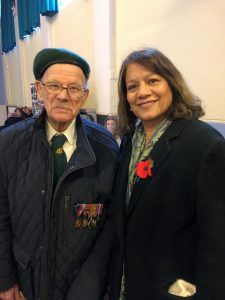 I am pictured below with Bill who is a veteran and is 100 years old. Bill also attended the service and the gathering at the Town Hall.